Development near transmission pipelines may increase the potential for pipeline damage, impede access for pipeline maintenance and emergency response, and increase risks to people living and working near the pipeline rights-of-way. Implement PIPA recommended practices listed below from the PIPA Report, Partnering to Further Enhance Pipeline Safety In Communities Through Risk-Informed Land Use Planning. Raise local governments' and property developers'/owners' awareness and support their implementation of PIPA recommended practices. Understand pipeline risk. Read Building Safe Communities: Pipeline Risk and its Application to Local Development Decisions. Evaluation Worksheet for Transmission Pipeline Operators. This can be used to perform gap analyses comparing current related practices to the PIPA recommended practices. Pipelines and Informed Planning Alliance. A brochure for all stakeholders regarding the PIPA Recommended Practices. Transmission pipeline operators should provide information about their pipelines to local governments and property developers/owners who are planning development around their pipelines. Local government authorities regulating development should use this information to establish requirements regarding land use and development around transmission pipelines. Transmission pipeline operators should develop and implement effective communications plans when communicating acceptable transmission pipeline right-of-way uses and activities to property developers/owners and other stakeholders. Transmission pipeline operators should identify barriers to effectively communicating with stakeholders and use communication techniques designed to overcome those barriers and effectively engage stakeholders to communicate with them regarding pipeline risks and how the operator manages such risks. Transmission pipeline operators should notify affected stakeholders of right-of-way maintenance activities, including vegetation management. Transmission pipeline operators should communicate in a documented and timely manner with property developers/owners to prevent or rectify unacceptable encroachments or inappropriate human activity within the transmission pipeline right-of-way. Transmission pipeline operators should implement enhanced damage prevention practices within the transmission pipeline right-of-way to ensure that pipeline operators and excavators meet on-site prior to excavation activity near high-priority subsurface facilities. 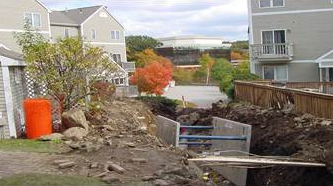 Transmission pipeline operators should have procedures and established contacts with local enforcement personnel in order to act appropriately to halt dangerous excavation activities that may damage their pipelines and potentially cause an immediate threat to life or property. When a transmission pipeline operator abandons a transmission pipeline, information regarding the abandoned pipeline should be maintained and included in the information provided to the one-call center.